The AB Courtyard Collection is a two-sided free standing patio wall system that has three main components plus caps - AB Dublin, AB York and a Corner Block. 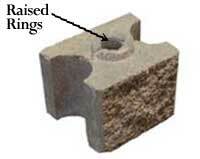 Modification of the blocks may be necessary to build a project. Check out the Courtyard Reference Guide for using the AB Courtyard Collection for more tips and tricks. The AB Dublin Block is an angled block available in left and right angles. There are two raised rings on the top of the block, these interlock the blocks together so adhesive is not needed. For starting or ending walls at posts/pillars, from an existing structure or when building corners the blocks must be modified to obtain one straight edge. There are three locations where the AB Dublin blocks may be modified. 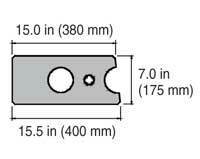 These units will need to be split or cut at a quarter (1/4), half (1/2) or three quarter (3/4) length. Note: The AB Dublin can be installed upside down when the opposite angle is needed during construction. This chould typically only be done on the top course. 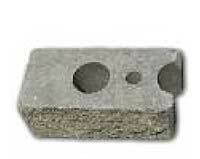 The AB York block is a tapered block, with a long and a short side. Creating curves with this shape is simple, and for straight walls, just rotate every other block. The Corner Block is an angled block. The block has no designated top or bottom; flipping it over creates the opposite angle. Use caps to finish off any AB Courtyard project. Wall Caps are used to finish the top of a wall panel. 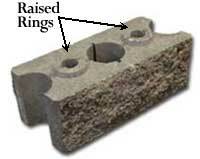 Post Caps are used to finish the top of a post or pillar. Two Post Caps are needed to finish each post. Secure them in place with masonry adhesive. The AB Dublin and AB York blocks were used to create this wall panel in the picture to the right. 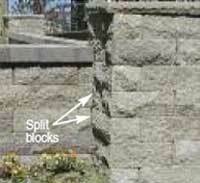 Where they meet the post/pillar (Corner Blocks) they will need to be split. This forms a straight edge and creates a finished look. More information on modifying blocks. Using the proper materials to create the base foundation for the panels and post/pillars is important when building on soil. We recommend using a compactible base rock material that is gravel in varying sizes of angular or smooth aggregates similar to the wall rock used in retaining walls or a road/ paver base type material. Using the AB York and the AB Dublin together in random patterns will create an added dimension and style to any project. This versatile system provides unlimited possibilities. No different than the colorful interlocking toy blocks of your past. Create outdoor spaces that are comfortable yet elegant for entertaining. Incorporate custom gates, counter tops, natural stone or pavers as beautiful accents for even more style. Illuminate the evening easily by adding lighting to the landscape. Choose between the two textures as well as create a pattern with the different block shapes in your project for a custom look that endures the test of time. All measurements shown are for reference only. Actual dimensions, weights and setbacks will vary by manufacturer. Check with your local Allan Block manufacturer for exact specifications and color availability.